Markham Infiniti | Blog | Markham Infiniti Reviews the 2017 Q50 400 AWD! Markham Infiniti Reviews the 2017 Q50 400 AWD! The 2017 Infiniti Q50 400 AWD is the ultimate in luxury sedan driving. It comes fitted with a 3.0 L V6 twin-turbo 400 horsepower engine. The 2997cc engine has 24 turbocharged valves, an aluminum-alloy block and heads with a turbo speed sensor, a water-cooled air charging system and dual water pumps, the DOHC valvetrain has four valves per cylinder with CVVTCS and the all wheel drive is capable of delivering 12.3 L/100 km on city roads and 9.1 L/100 km on highways. 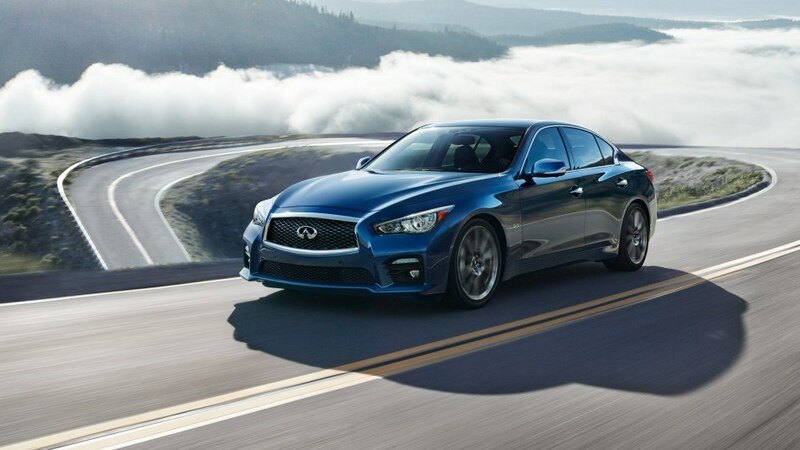 As the name implies, Infiniti’s Q50 400 AWD can generate 400 horsepower at 6,400 rpm and 350 lb-ft of torque at 1,600-5,200 rpm. 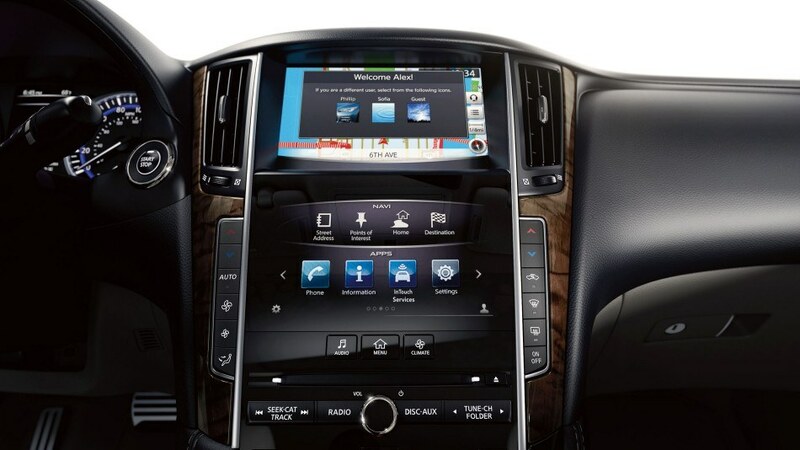 It features seven speed automatic transmission, electronically controlled and with Adaptive Shift Control (ASC). There is a Navi Synchronized Adaptive Shift Control, along with Infiniti Drive Mode, Hill Start Assist and Intelligent All-Wheel Drive systems. 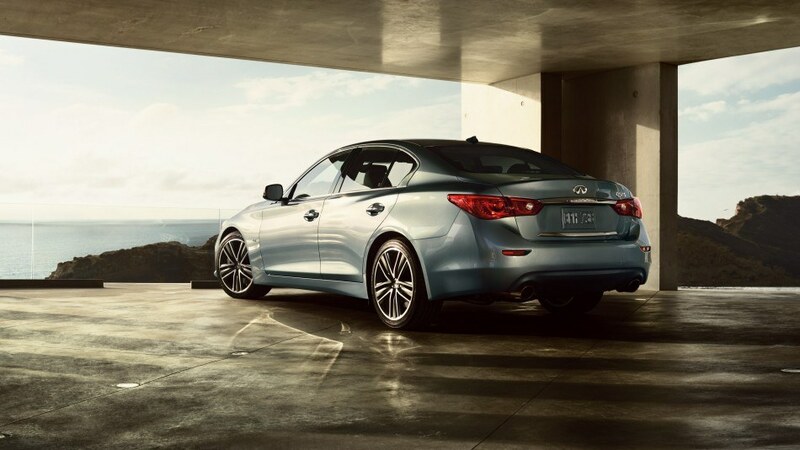 The Q50 400 AWD has RACK EPS, Active Trace Control, Dynamic Digital Suspension with double wishbone independent shock absorbers with coil springs and dual pistons for the front and multi link independent double piston shock absorbers with coil springs and stabilizer bar for the rear wheels. The 2017 Q50 400 AWD has automatic LED headlights and fog lights, LED rear brake lights and a center high mounted spotlight, ultraviolet reducing solar glass, airflow management, powered moon roof with tinted glass, remote power opening of windows and keyless system, door handle with touch selective unlocking, heated and powered outside mirrors with auto dimming and integrated LED indicators, speed and rain sensing intermittent windshield wipers at the front, rear window defroster with timer and indicator light, dual exhaust tips with chrome finishers and brushed with satin finish. The Q50 400 AWD is equipped with all the bells and whistles including Infiniti Intelligent Key, dual zone climate control with micro filter, rear air vents mounted in the console and heater ducts in the rear floor, trunk lockout feature and valet key, front sun visors, illuminated vanity mirrors, overhead map lights for driver and front passenger, reading lights for rear passengers, map pockets and bottle holders in the front doors, cup and bottle holders for rear passengers. The front armrest has a storage compartment, auxiliary input jacks with USD ports and two power outlets (12V). The Q50 400 AWD has front and rear carpeted floor mats and leather appointed seating, Kacchu aluminum interior trim, 8-way power sport type front seats with lumbar and torso support adjustments, 60/40-split folding rear seats, dual occupant memory system and leather-wrapped three-spoke heated steering wheel and shift knob with aluminum accent. 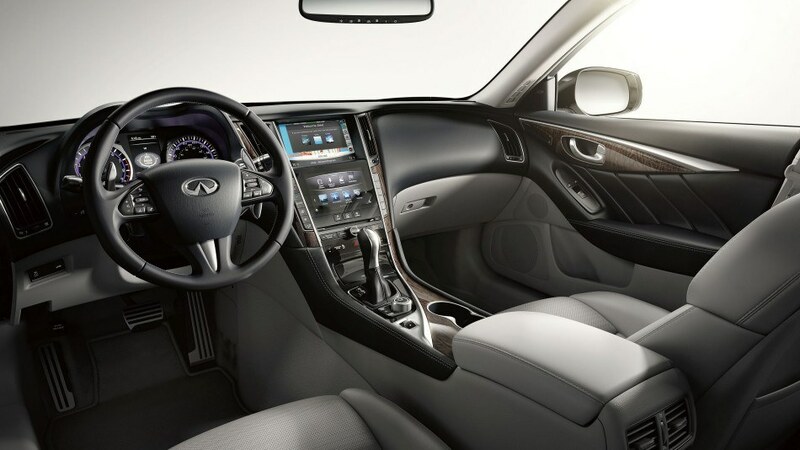 Infiniti packs in all the necessary active and passive safety features including its Advanced Airbag System, side impact airbags and many more safety functions. Overall, this is one fully maxed and luxurious ride!! If you’re in the Markham or Toronto area, then we invite to come for a test drive at Markham Infiniti today! View the 2017 Q50 400 AWD on Infiniti Canada.